who is Specialty Plastics Inc.? 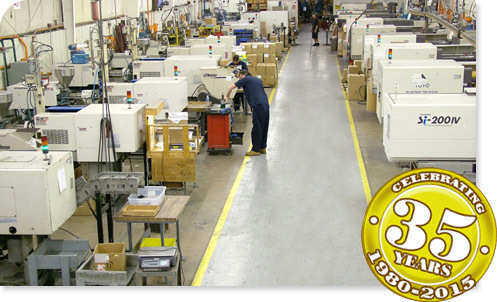 Specialty Plastics Inc. is a custom plastic injection molder located in St. Peters, MO. Our core competency is tight tolerance plastic parts. For over 35 years, we have supplied high quality injection molded products and services to a wide array of business: medical instruments, automotive, healthcare, home appliances, sporting goods, electrical and many more. Injection molding is our specialty. At Specialty Plastics, we consider business a partnership with our customers. We cannot continue to grow unless our customers do so. Let us show you the benefits you’ll gain with a partnership with us. As a custom injection molder, we have the technology and machinery to provide a wide range of services to our customers. With 21 state of the art injection molding machines and over 35,000 sq. ft. of manufacturing space, we can mold parts ranging from 3 oz. shots (35 ton press) to a 68 oz. shot (500 ton press). We also perform thermoset molding, insert molding and over molding. All of our machines have robotics for easy part removal and labor savings. In addition to injection molding, we also offer blow molding services. Whether you need a bellows design, plastic bottle design or other blow molded design, we have the capability to blow mold your plastic part application. If there is a service you're interested in that you don't see on our site,just ask. Specialty Plastics is your full service plastic injection molder.